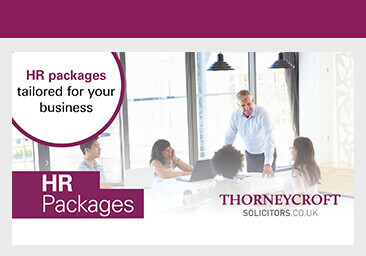 At Thorneycroft Solicitors, our Employment and HR team offers businesses a comprehensive range of legal services including our Employment Shield package. Our specialists have a wealth of experience and are experts in all aspects of employment law, compliance and HR. We understand that employment law is a complex area which can be very costly to your business if you get it wrong. We provide a client focused and professional approach to understand your objectives and help you achieve them. We take away the time and stress of dealing with legal and HR issues, leaving you to focus on running your business. Our services are tailored to your individual business needs at a cost that represents excellent value for money. Whatever the size of your business, we have a range of options to suit.